Yahoo! India was recently accused of plagiarism by some Indic bloggers (see screenshot). The food recipes published on one blog were copy-posted on Yahoo! 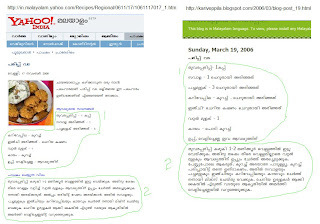 India's Malayalam portal without any sort of attribution or credit to the original author. The Malayalam story was provided to us by Webdunia.com (the content provider) on the express representation that they are duly authorized by the author of the story to publish it. In the circumstances therefore, we do not admit of any copyright violation, as alleged by you. Although there is no copyright violation and without prejudice to our rights, the said story has been removed from our web site, to avoid any further controversy. Should you have any further concerns on copyright violations, please write in to copyright@webdunia.com and it will be addressed by the webdunia team. While it becomes clear that Yahoo! India did not directly take the content from blogs, the slightly worrying part here is that they are asking users to follow-up with WebDunia to report copyright violations in future. Why should this be any different from Yahoo! 's standard copyright policy ? Even when the content is sourced from third parties, it still remains the responsibility of Yahoo! to ensure that the content published on any of their portals is not copied from somewhere else without permission. With a spirit to give quality content to the web-surfers, one of our sub-editors has erroneously picked some content on specific recipes, which was compiled by Mrs.Sugaythri. This was done rather innocently and inadvertently, as the sub-editor wished that the readers could benefit from the special preparations that were web-published as he himself liked that material to his judgement. It is indeed an error on our part as the sub-editor should have taken prior permission from the original contributor before web-publishing such descriptions. Webdunia makes an unconditional apology for this lapse. On a lighter not, Dhurvirodhi is running an interesting cartoon strip that says - "Yahoo! India subcontract Plagiarism." Update: Yahoo! seems to have changed their stand on the whole recipe plagiarims issue and have issued an apology. Here's the recent statement made by Yahoo! India which was sent to us by their PR firm. we completely endorse the values of blogging on the Internet. No matter who supplied them with the content, the blame rests on Yahoo! 's shoulder since the stuff was pasted on their property.